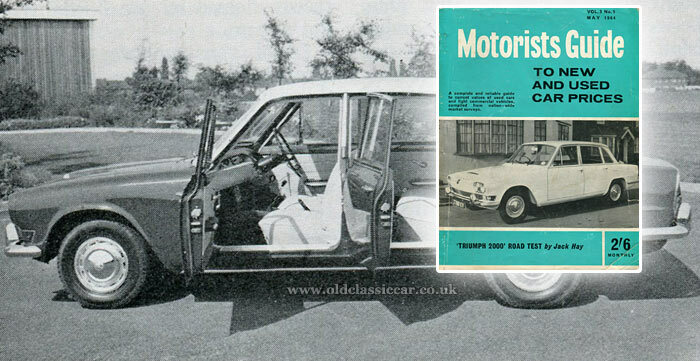 Motorists' Guide magazine from the 1960s & 1970s. Homepage. This page: Three magazines aimed at motorists looking to buy a new or used car. I've three copies of The Motorists' Guide, dating from the mid-1960s to the early 1970s. In those pre-internet days, anyone looking to either buy their first car, or upgrade from their existing steed, would rely on the opinions of motoring journalists - in addition to word-of-mouth recommendations from friends and family - when making their decisions. Newsagents stocked a number of motoring titles, to aid the decision-making process. 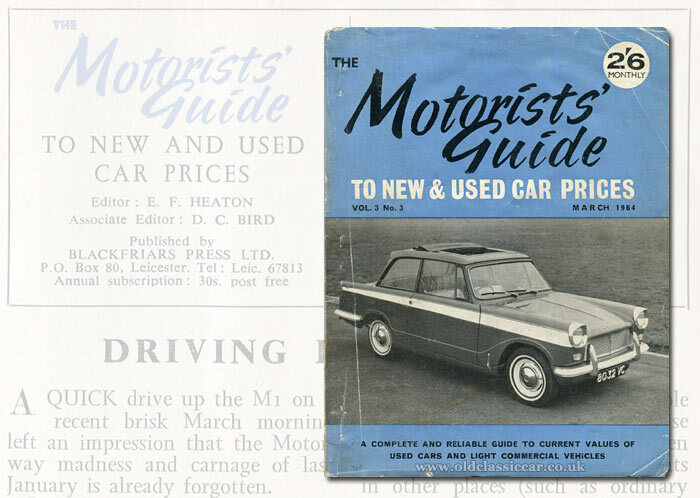 A number of these publications, for instance The Measham car guide and Popular Motoring, already feature in this section of the site. Coincidentally, the featured copy of Measham also has a Triumph Herald on its cover. My earliest copy of "The Motorists' Guide To New & Used Car Prices", to give it its full title, dates to March 1964. As mentioned already, it has a Herald on its cover - in two-tone 12/50 guise, registration 8032 VC and fitted with whitewall tyres. Very snazzy. This copy is Issue No.3 of Volume 3, suggesting that the magazine first broke cover in 1962. The cover price in 1964 was 2s 6d, and according to the small print, was only sold through W.H. Smith's. Cars of British origin, built in factories across the land that were for the most part still in British-owned hands, dominate of course. Companies such as Auto Union, BMW, Renault, Borgward and VW to name just a few, fly the flag for the increasingly-common imports that were continuing to gain a following amongst buyers in the early 1960s, a trend that continued unabated to this day, where few cars roll out of British-owned factories any more. Magazines of the day were usually jam-packed with advertisements for both cars, and car-related products. Revenue-raising advertising within The Motorist's Guide's 108 pages is noticeably thin on the ground. The rear cover advertises Midlands-based garages belonging to G.A. Hill, while inside a thorough search turns up an ad for Goodyear Ultra-Grip tyres, and a half-pager for Macbrayne's car ferries (a timetable for Macbrayne's coach services may be found here). That's it, plus a one-page promo for the magazine's publisher - Blackfriars Press Ltd. The remaining pages are given over to motoring features, a readers' query section, and a road test - here for the 12/50 Herald that is shown on the cover. Benefits of choosing the 12/50 over previous models included the desirable (in summer at least) full-length sunshine roof, and a slightly more powerful engine that benefited from the fitment of the sportier Spitfire's revised camshaft. The compression ratio had also been raised by Standard-Triumph's boffins, the combined improvements enabling the engine to produce 51 bhp, 12 more than the previous 1200. Disc brakes were now a standard fitment. The reviewer, Mr Jack Hay, while still having a few criticisms to level at the Herald as a vehicle, was overall quite impressed with the package on offer. Just two months later, and the magazine's cover had received something of an overhaul. The price remains the same, and once again a Triumph - this time a Mk1 2000 (3788 KV) - is on the cover. The typefaces are different, and the title has been truncated to just "Motorists Guide", the apostrophe and the word "The" deemed to be no longer necessary. The rear cover contains no advertising on it at all this month, nor is there any within this copy's 110 pages. Mention of W.H. Smith newsagent as being the sole retail outlet for the magazine has disappeared, so perhaps other newsagents were able to stock this small-format title on their shelves now. Once again it is Jack Hay who dons his driving gloves and takes to the roads of Britain, to assess the Michelotti-penned Triumph in his latest road test. His review of the Canley-born 2000 was even more glowing than that of the Herald, so any reader interested in this six-cylinder, commodious, and well-finished saloon, was unlikely to have been put-off from purchasing one, based on this review. There then follows a fairly dreary look at religious wells that can be found across the country, before the magazine's raison d'etre - new and used car pricing - springs forth, on page 18. AC Cars of Thames Ditton once again leads the way, the final car to be described being the Wolseley 6/110. Light commercial vehicles then take over, as in the earlier copy, headed by Austin's 1/4 ton Mini van and pickup, and ending with VW's 15cwt delivery vans and pickups. To January 1973, and by this point the magazine's design had changed once again. Not here an example of Triumph's finest on the cover, instead its Dagenham's rakish Capri, in facelifted Mk1 form, emblazoned - in luminous green (very 1970s) - before the reader. A trio of stylishly-dressed hipsters chat casually in the background. Advertising is of more prominence in this 1970's issue, although is hardly dripping from its pages. Most relate to vehicle finance, insurance, or inspections, although page 5 is given over to Dinitrol's "Super GML System" rust-proofing service, something that car buyers in the 1970s would do well to consider. Following on from a few words highlighting the increased interest in the use of Wankel engines, there follows a road test (undertaken by Mr Ian Webb) of the glitzy Hillman Hunter GLS, a well-spec'd, Rostyle-clad, up-market cousin to the lesser-equipped Arrow-series Hunters. The improvements weren't all cosmetic though - the boxy saloon packed the souped-up, 93bhp Holbay-tuned engine from the H120 Rapier fastback, beneath its square-cut bonnet. The 0-60 time of 9.3 seconds wasn't half bad for the era, and could still embarrass a few cars even to this day. Low-gearing helped with the sprint from the traffic lights, although pegged its maximum speed at 103 mph in overdrive top, if thus equipped. Plenty of motorists' eyes though were focused on economy motoring, rather than white-knuckle performance, so the GLS and cars of its ilk were something of an irrelevance to them. Balancing the content within this month's issue is a look at the pint-sized Fiat 126, a boxy update to the original 500 that continued in production alongside its sharper-looking younger brother. With economy figures in the region of 50 mpg available, to cost-conscious motorists with a light right foot, it had a lot going for it. I remember a neighbour running one in the 1970s for years, although her right foot was anything but light. 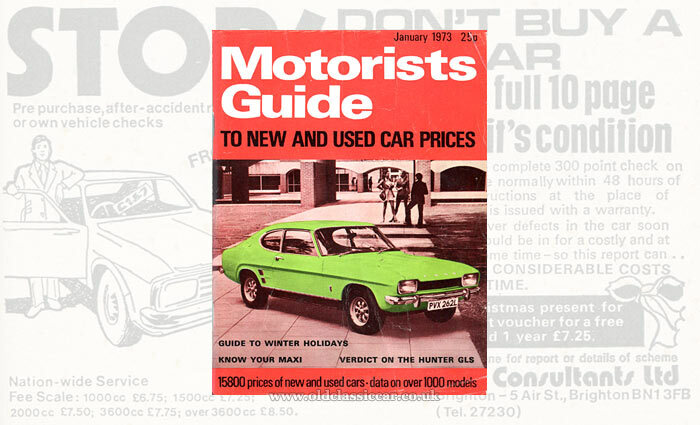 The car-related information, away from the buying facts and figures, is a lot more comprehensive in this 1970s edition of Motorists Guide, when compared to those of 9-10 years earlier, although the price guide for light commercials had been dropped by this point. Fans of British Leyland would no doubt have found this month's "Know Your Car" feature to be of interest, for here the worthy-if-unremarkable Austin Maxi fell under their spotlight. A potted history from the model's introduction in 1969 as a 1500cc car, through the introduction of the 1750 and, in 1972, the 1750 HL ("Highline"), is given, followed by a peek at typical prices for replacement parts, ranging from a short engine (68 GBP), to a front door in primer (21 GBP) and exchange brake shoes (3 GBP). Three pages of photographs and captions highlight the key areas to check, when looking to buy a 3 or 4 year-old example. Rear suspension pivot bushes, CV joints, and cranky gear linkages on the early cars, all get a mention. In the buyers' guide section, AC still holds pole position, although Alfa-Romeo takes second spot, ahead of Alvis which has now been demoted to third. While it's tricky to compare eras, then and now, there are a few entries that most enthusiasts would happily jump into a time machine for, if only to purchase and squirrel them away somewhere, so that they could be "re-discovered" now in timewarp "barn find" condition. An Aston DB4 GT from 1959, valued at around 1200 GBP, would be high up on my list although at the time was still a fairly pricey bit of kit (comparable at the time to a 3 year-old TR6 for example). Does anyone reading this know how long the magazine continued in print for? Return to the car magazines section. A pre-war car buyer's magazine, dating to 1938 and titled "The Used Car", can be found on this page, also here at Old Classic Car.